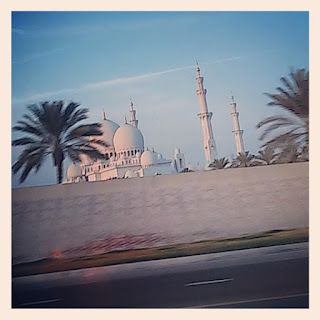 No, we're still enjoying our adventures here in the United Arab Emirates, but I've moved the blog. We are standing on a tennis court, arms spread out wide. “It’s not that hot,” I lie, wiping the sweat off my forehead before it seeps into my eyes and renders me blind with my body's own stinging salt. “Yeah, there’s actually a nice little breeze,” my tennis partner says, also lying. She flaps her arms, trying to catch whatever gasp of cool air might be floating our way. But the ‘breeze’ she’s talking about isn’t one of those gentle 10 mph jobs that keep places like the Caribbean bearable through the summer months. This ‘breeze’ wouldn’t get a feather to float. In fact, this 'breeze’ is nothing more than a cough, and subsides before we pick up our rackets and attempt to keep playing in a ‘real feel' temperature of about 110 degrees Fahrenheit. 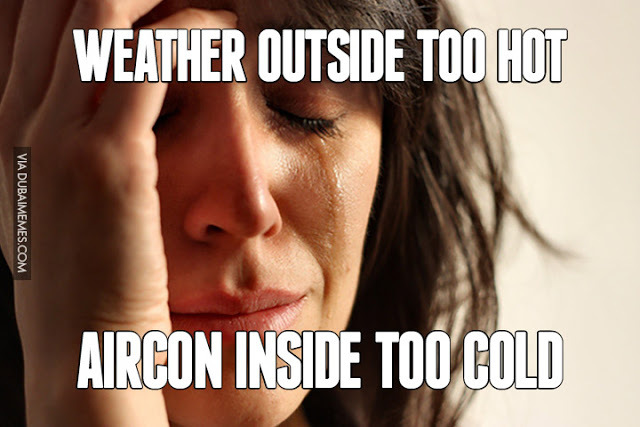 (I should mention, it's barely 9 a.m.). Out on the golf course things are similar. We’ve already pushed back our start time by an hour to make the most of the cooler mornings, but by the time we’ve rounded to the ninth hole, I’m practically delirious. Despite sticking to a rule of sipping one 12 ounce bottle of water per green, I feel dehydration taking over. 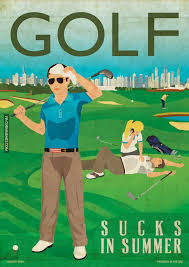 I’ve got a massive headache, can’t remember how many strokes I’ve taken, and despite being plied with cold towels and ice pops on the course, I just want to make it back to the club house before collapsing so I can take a cold shower. It will take me 1.5 days to recover, but I will lie to myself, convince myself that I'm fine and attempt to do it all over again the following week. 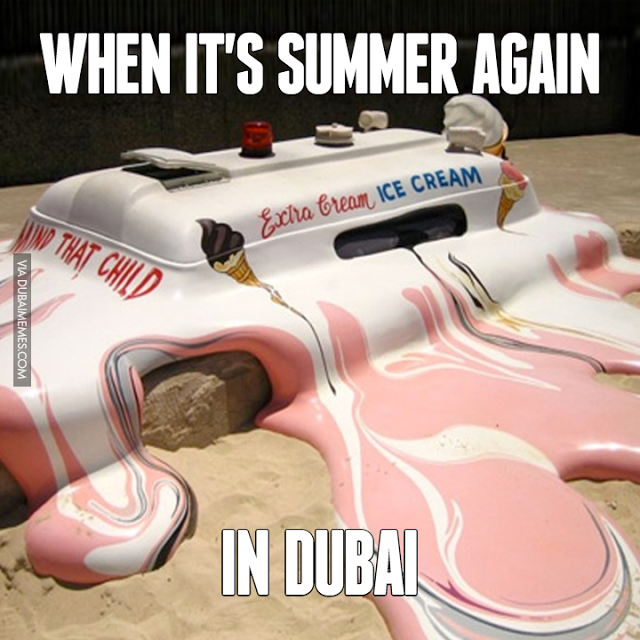 Welcome to summer in the UAE. Despite my heartiest efforts to stay outdoors, this is the time of year when my routine switches. As I count down the weeks until the ‘heat really sets in,’ I find myself running around madly trying to take advantage of all the great outdoor things in the region. There are beach days, camping weekends, golf and tennis outings, biking and even running. There are barbecues and dining al fresco, and walks along the Corniche. Indeed, between March and May, we work hard to get it all in while we can. And when the summer comes? Well, that’s when I pick up my reading, indulge in daytime movies, and hang out in the malls. Yes, I know. This New Yorker hangs out in malls. Mall life in the UAE is ‘different’ as well. During our first year here, any time John would mention a mall outing I’d practically get angry – as if we couldn’t come up with something... anything... better to do. Back home growing up, malls felt tacky and dismal, a sad commentary on the vast lack of recreational activities or cultural offerings available to us. What I failed to realize, is that malls here in the UAE are full of awesomeness -- ice-skating rinks and aquariums and movie theaters and good restaurants. Truth be told, malls are a real treat and part of the great life we enjoy in the UAE. After exploring mall culture here, I realized that going to the mall is like taking a stroll on the High Street (or spending an afternoon hanging out on Columbus Avenue in NYC). In the UAE, saying you’re going to the mall is the same as saying you’re going into town. In fact, malls in the UAE have dress codes (no hanging out in your cut off dungarees looking like a slob) and each mall has its own vibe, the same as different neighborhoods or sections of a city might have back home. UAE malls serve as town centers largely because of the heat. Where else can local people gather with friends and extended family comfortably, and where else can expats go for a meal, a mooch around the book store, a coffee or ice cream, to check out a movie, and stop by the supermarket (also in the mall) to buy a couple of things for dinner with a minimal amount of sweat? I’m lucky in that we live within distance of a mall that I can walk to in the middle of the summer without spontaneously combusting. Some people even live in buildings with malls in their lobby. But as someone who lived in New York City for more than twenty years and was proud because it was a place that didn’t have any malls (except for that horror on 34th Street), I have really changed my views. Now, especially in summertime, I find myself craving the mall (not cringing about it the way I did as a teenager). I even have favorite malls that I frequent in Abu Dhabi. Khalidiyah Mall is my hometown mall, while Marina Mall is my fave for women's fashion clothing and easy parking. John and I have a soft spot for Dalma Mall, with its Shake Shack, Emack & Bolio ice cream shop and we like to check out the outdoor gear and sporting goods shops, you know, for when the heat breaks. And now that Pizza Express has opened at the World Trade Center Mall, well, we're all over that mall too! So here’s to summer in the UAE! 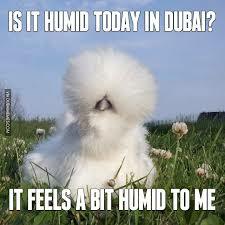 And there’s even worse humidity to follow. But at least there’s always the mall. 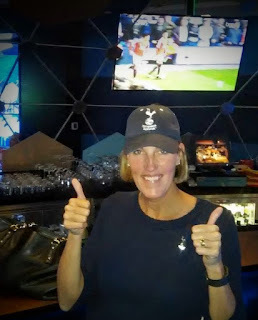 That was me, back when this New York City gal started crossing the Atlantic with her then new steady boyfriend who happened to be a Tottenham Hotspur supporter (along with two generations of his entire family). We were commiserating over a pint at the Irish Cultural Centre following a disappointing loss at White Hart Lane. From the glare I got from John (the beau who would eventually forgive me and become my husband) and his first cousin (who still hasn’t forgiven me), I had only begun to realize just how deep support of one’s English Premiership team runs – not to mention the ground I’d have to make up if I wanted to be welcomed into the family fold. Over the years, I’ve tried my best to support Spurs, sort of following along but not really keeping track of their top players, their managers, their trades, or their standing in the table. And while I named my first cat after former Tottenham striker Mido (I had witnessed his stunning two goal debut in 2007 at White Hart Lane), I admit that it wasn’t so much because I was a die-hard Spurs supporter, but because I knew that by naming the cat after a Spurs player, John would be more likely to embrace the new orange tabby in my life – and that calling a cat 'Klinsmann' just didn’t have a good ring to it. Over the past two years of living in Abu Dhabi, I’ve found a whole new love for the 'beautiful game,' mainly due to living in a far more forgiving time zone, combined with what's become of this blossoming young team just hitting its stride. With many Premier League games starting as early as 8 a.m. in NYC on a weekend, getting up and making my way to a sports bar that showed the Tottenham game felt like too much heavy-lifting. To say that I’m not a morning person is an understatement. My friends, former work colleagues and even my husband know that there’s an unspoken ‘do not disturb’ sign that hangs over me until ten in the morning. Also, the weekend trains in Manhattan are notoriously slow… or non-existent, making it an hour or more endeavor to get to a spot to watch a game when during the week the same trip might only take 25 minutes. Even further, on the rare occasion that I’d make it to watch a game, the guilt of being in a bar that early and the unwritten obligation to have a beer as a way of thanking the establishment for showing the match, was even to this enthusiastic beer drinker -- a challenge. So fast-forward four time zones ahead of the UK, and suddenly watching English football has a whole new aura. Here in the UAE, watching the footy is predominantly an evening activity, which often falls on a Saturday. With our work week starting on Sunday, it has become a nice way of winding down the weekend either at a local sports lounge, or at home with a nice meal. Even our cats support Spurs. Also, here in the UAE there are TONS of footy fans. While ‘back in the day’ supporting English football in New York City was kind of a fringe activity (that has recently become the new hipster thing to do -- along with things like playing shuffleboard), the UAE is kind of like a Little Britain, there are tons of British expats here, and I’ve met gaggles of ManU and other football supporters. Also with local investment in teams like Etihad’s Man City, NBAD’s Real Madrid, and Arse-*al’s Emirates Stadium, there’s always something to talk about when you’re following the footy here -- there are even ‘supporter clubs,’ where you can meet up with like-minded football fans to watch a game together. But also, the confluence of Spurs’ strength that has brought Tottenham to the top end of the table has been the biggest gift of all for this once wishy-washy now die-hard Spurs fan. Last year as I began to awaken my senses to the beauty of football, we saw the beginnings of the brilliance of Harry Kane. This year we watched as he fumbled during the first few games, then literally got his footing to become the highest scoring striker in the league this season. I recently took the time to learn how to pronounce 'Pochettino' correctly, and began researching the Spurs’ manager’s past, seeing where this new style of fast play and not taking crap from the other team has emerged. I began to fall hard for all of the players… following the bromance between Dier and Alli on Twitter, adoring the work of Son, Lloris, Vertonghen and Dembele on the field… and oh, when Lamela pulled off that rabona…! I even began singing “We’ve got Alli” -- for no reason at all. What I didn't realize was that I had fallen in love. 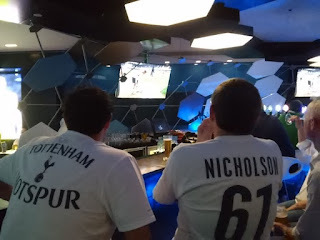 Our passion for Spurs this year got so intense that John and I went to watch the team play in the Europa Cup in Baku. And there wasn't even a question when John had a chance to go watch Spurs versus Dortmund. I sent him packing, it's just what you do. Over the past few weeks, Tottenham has felt the pressure, being a young squad and the last team standing a chance to nick the top spot of the Premiership from Leicester. I’ve felt the pressure too. Last week, Dele Alli got a ban after being targeted on the pitch by West Brom. Even though his ban was legit, I was spitting nails at the whole episode, of how he was goaded after just being handed the Player of the Year Award on the field. And this week, Spurs' chances at winning the league were dashed by Chelsea and the team earned a record nine yellow cards during the game. All deserved, but the Chavs were hardly playing fair… or nice. And me? I was gutted. First cheering and jumping around the living room at the two goal lead, then crushed in the ruins as it all went to hell in the second half. Thinking back to that afternoon at the Irish Centre, I knew it all went with the territory, but I had never 'felt all the feels,' about a sports team before. I didn’t cry, but I did grieve at how hard Spurs fought, at how beautifully they played this season, and at how overlooked they have been when everyone keeps talking about the ‘fairy tale’ that is Leicester. 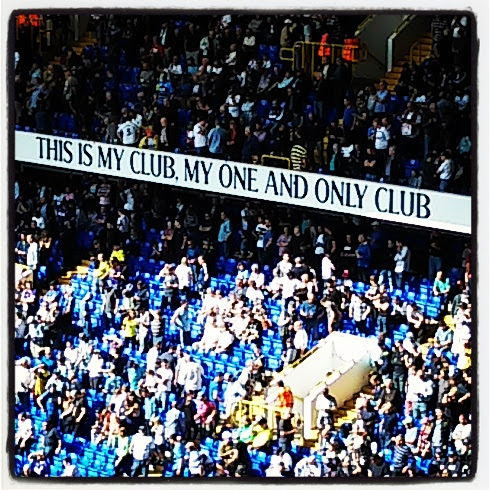 Because for me, the real fairy tale, the true romance, is with Spurs. So even though the last game of the season hasn’t yet been played, and we're still working to hold off another league rival, I’m already counting … just 101 more days until the next season begins. That’s how I usually introduce myself. Back home in New York, we love the Yankees and hate the (Boston) Red Sox, think our pizza is better than Chicago’s, and can’t comprehend why anyone would want to live any place else in the world other than in “The City.” It’s what we call ‘hometown pride,’ and whether you’re a born and bred New Yorker, or a transplant, one wears their New Yorker-ness as a badge of honor. 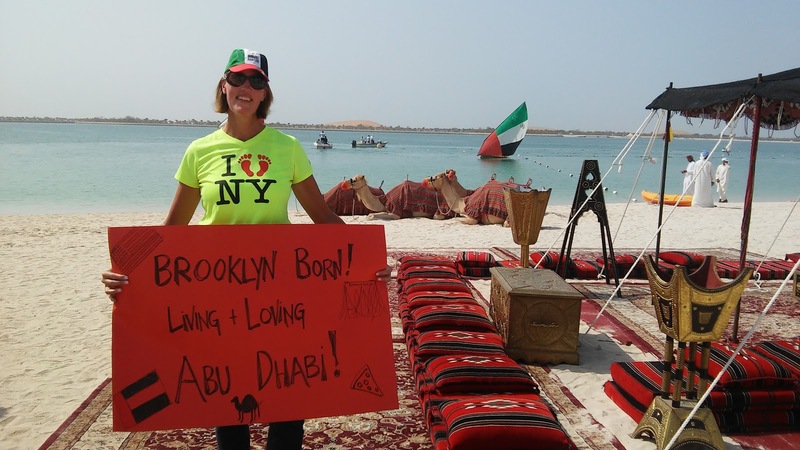 As a ‘born and bred’ New Yorker, leaving the city was one of the biggest hurdles in starting a new life in Abu Dhabi. With life so fast-paced and cut-throat in New York City, when one has the opportunity (or is pushed) to leave, it’s hard not worry that people will see one’s departure as some sort of personal failure. 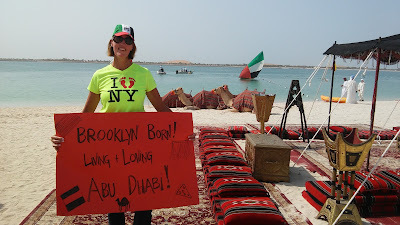 So nearly two years into my ‘new’ life in Abu Dhabi, I’m still a New Yorker, but I’m feeling a different kind of hometown pride as well. Recently, Dubai was dubbed the best city in the Middle East for expats… beating out Abu Dhabi for the top spot in the region. Upon reading this news, I can’t deny I got my back up a bit. 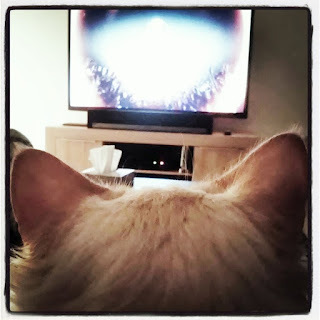 Showing my pride when America's favorite morning show aired live from Abu Dhabi. For people who have never been to the UAE, Dubai and Abu Dhabi are as similar as they are different. Sure, we’re both part of the United Arab Emirates. And both cities are dynamic, progressive even. But Dubai and Abu Dhabi have totally different vibes and it’s hard to explain the differences to people who don’t live here or haven’t visited before. I often compare Dubai and Abu Dhabi to Los Angeles and New York. Dubai’s geography is vast, the city extends for miles and miles and the traffic on Sheikh Zayed Road is as notorious as LA’s 405. A city of superlatives, Dubai is glitzy and has a star-struck element that lures the world’s top celebs. In that way, Dubai verges on being like Las Vegas and I think that’s where Westerners forget that there are certain rules of etiquette that need to be honored here – you can’t just get all sin-city in Dubai. On the other side of things, Abu Dhabi is the capital of the Emirates, and is the seat of power for this very, very powerful nation. Unlike the sprawl of Dubai, Abu Dhabi’s heart is on an island laid out on a grid, much like Manhattan. While Dubai shows its wealth with tall glass buildings, Abu Dhabi celebrates its strength with its verdant riches. And while you may be wondering how a place might demonstrate its deep pockets through planted trees – just try growing a lush rain forest in a desert and you’ll understand completely. Much like New Yorkers revere places like Central and Prospect Park (green space where investors could be prospering with prime real estate), in Abu Dhabi we enjoy an embarrassment of green spaces, whether it’s the Al Ain oasis, the modern Mushrif Park, or the drive along the palm tree-lined section of Sheik Zayed Highway -- that abruptly stops when you cross over into the emirate of Dubai. Where Dubai has a fast-paced mindset that centers around tourism, media and real estate investment – fast-talking, fast-paced and young; Abu Dhabi is deep into oil, culture, finance, and, well, oil. It’s stately, quiet and proud. 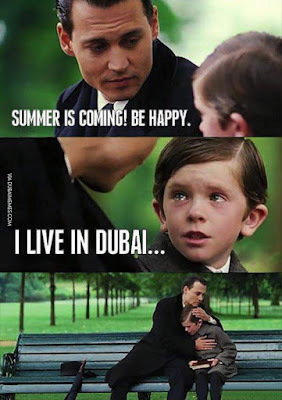 For the most part, people who live in Abu Dhabi don’t like the idea of living in Dubai, and people in Dubai wouldn’t dream of living in Abu Dhabi. Truth be told, Dubai and Abu Dhabi have what I believe is an unspoken rivalry that plays out in interesting ways. 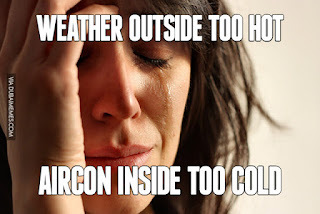 And it kind of goes like that here. And while Dubai has its epic brunch, Abu Dhabi has, well… The Dubai Brunch. Okay, you can't win them all. Recently I went back to the States for a quick hit of New York City living and to get a fix of my fabulous forever friends. Though I understand it's still winter, New York seemed dark, dirty and dangerous. Moreover, I felt out of step with the place. Unlike my New York-self, I didn’t have a thousand places to be or a million things to do. Living in New York, I was always busy, busy, busy. But this time, even the dogs seemed like they had more urgent places to be than me. For the first time since living in Abu Dhabi, I didn’t feel like New York was home and I was just temporarily away for a while. And it's okay, New York may be home again at some point in the future, for now, I’m clearer about my present place in the world. On the return flight to Abu Dhabi, a fellow passenger asked me where I’m from. “I live in Abu Dhabi,” I proudly replied. But I’ll always be a New Yorker. Well, yes, actually, it is a very big deal in these parts. So far this season we had one other day of rain, I think sometime in December. Then a bit of a sprinkle, for about two minutes, in October. Before that, the last time it rained was last January... so we probably won't get rain again for another nine or ten months. I remember back in the States one time when I was in Los Angeles and it rained. The place went nuts. It seemed like just a normal, rainy day, the kind you get fairly regularly in New York. You'd wake up, see the grey sky, grumble a bit, then put on the rain coat, bring the umbrella and leave behind the good pair of work shoes. But in LA, people stopped working. There were warnings and alerts and live broadcasts of newscasters in the street discussing the rain, with people making goofy rain-dance gestures in the background, all for a bit of rain -- all quarter of an inch of it! I laughed at this stuff, but now, it's happening to me. 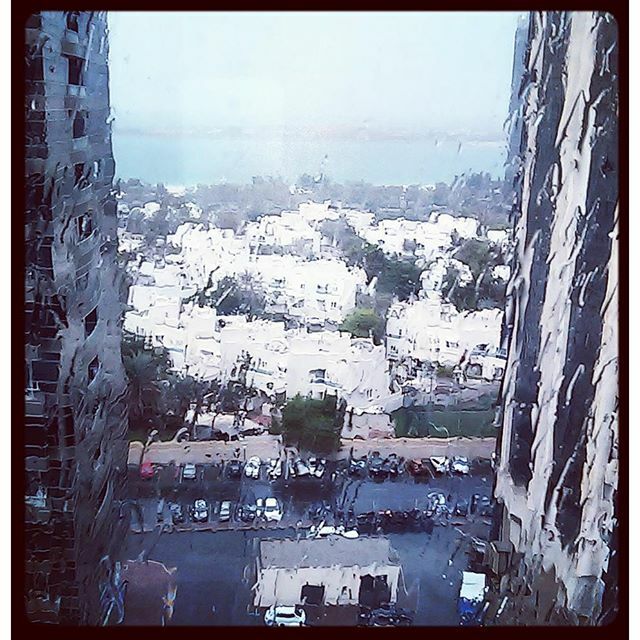 A rain-soaked downtown Abu Dhabi. This morning I woke up, saw the grey and wanted to dash out and do the Snoopy dance in the streets. Rain! Glorious, beautiful, Sting-singing 'I dream of rain, I dream of gardens in the desert sand' kind of rain. And then, I just wanted to curl up, drink tea and read the paper in front of the window while watching it pour. I don't even drink tea!